Cardamom is a wonderfully aromatic and highly valued spice with its' origin in the moist, rich forests of Southern India, and has over the years earned the title of "Queen of Spices". Central Africa and Vietnam. It is important not to confuse these different types as they are quite different in character. 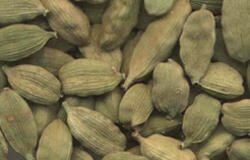 Cardamom has a pleasant aroma with a characteristic, light pungent taste that gives a warm feeling in the mouth and contains an aromatic oil which can be extracted by distillation or as an alcoholic tincture for use in traditional medicines, perfumery and as a flavouring for liqueurs and bitters. It is also of course, used extensively in cooking throughout India, Sri Lanka, the Middle East, Northern and Eastern Africa and South East Asia where it is an essential part of traditional spice mixes such as Baharat, Berebere, Ras el Hanout, Zhoug and Garam Masala. In Arab countries cardamom is widely used to flavour coffee which is a very important symbol of hospitality and is prepared either by adding freshly ground seeds to the coffee powder or by steeping a few cardamom pods in the hot coffee. Cardamom is used to flavour curries, cakes, bread, confectionary, meat dishes, sweets... and is finding many new fans who are eating modern creative ( fusion ) cuisine. Like all spices Cardamom should be purchased as fresh as possible and complete - as the whole green pods. It quickly loses its flavour once it is ground and even as whole pods will lose about 40% of their potency per year of storage.